I've come across this issue randomly a couple of times over the past few months and have just had some time tonight to troubleshoot the problem and post it up here. 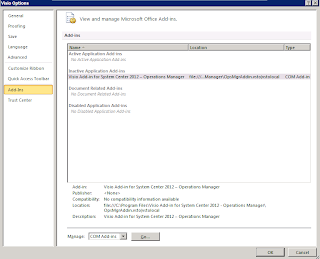 The issue relates to the Visio add-in for System Center 2012 - Operations Manager (SCOM/OpsMgr 2012) and the fact that in some cases, it simply doesn't load into Visio as it should do. 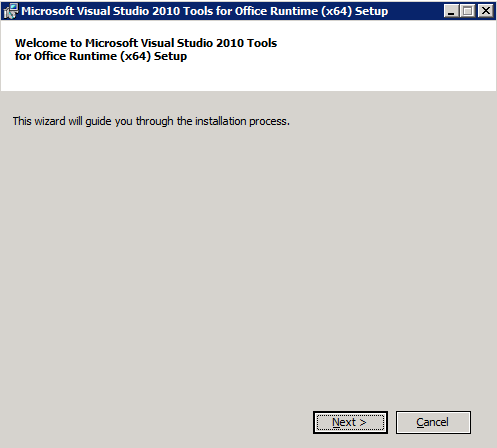 Typically, in my lab or test environments, if I am configuring theVisio and SharePoint integration of SCOM 2012 using the 'Visio 2010 and SharePoint 2010 Extensions for System Center 2012', I would download the file, unzip it and then run the Visio add-in installer on the computer that was running Visio 2010 Professional or Premium edition. Generally, this would install without any issues and as soon as I open up Visio, the integration tab for Operations Manager is available. In some instances however, after the Visio add-in installer completed successfully, when I opened up Visio, the add-in wouldn't launch at all. When I clicked on the Go button to manage the COM Add-Ins, I was presented with a screen similar to the one below. I could also see from that screen that the Load Behavior was configured to 'Load at Startup', which means that I shouldn't have to do anything for the Add-In to start. The solution to this problem in the end was actually quite simple. 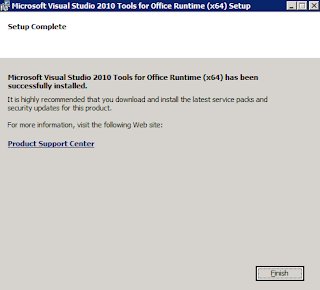 I found that the error tended to only occur when I was installing the add-in onto a server that had Visio installed on it as opposed to a client pc or laptop. In my lab/demo environments, I would normally just deploy Visio onto one of my SCOM management servers and enable the 'Desktop Experience' feature to allow for uploading graphics to SharePoint. 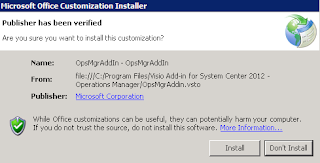 If I tried running the Visio add-in installer from a client pc or laptop, it always worked for me without issue so I went about comparing software prerequisites for the Visio add-in between my laptop and my servers. What I found was that on the server, I was missing the Visual Studio 2010 Tools for Office Runtime (VSTOR) and this was listed as a requirement in the Visio and SharePoint extensions documentation. After you click Install, you will then be able to see the Operations Manager add-in tab from within you Visio window allowing you to configure integration to your SCOM 2012 management server. Hopefully someone finds this quick solution helpful! 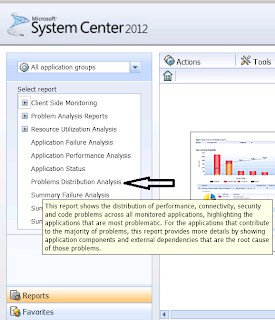 In Part 1 of this series I walked through the Application Diagnostics console that comes as part of the System Center 2012 Operations Manager (SCOM/OpsMgr 2012) APM feature. 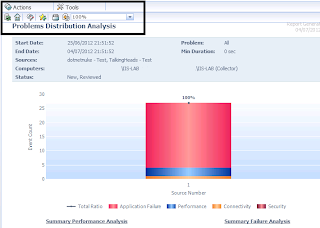 This post will deal with the Application Advisor console that also comes bundled as part of APM. 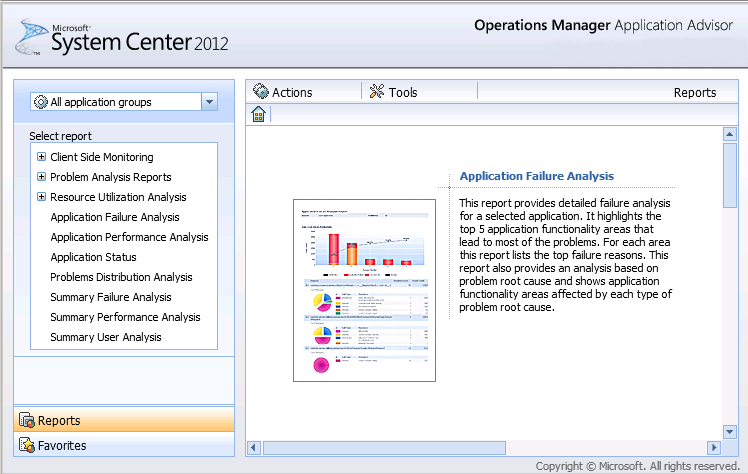 The Application Advisor is a web-based console that comes bundled with over 30 pre-configured reports to help you to analyze event and performance issues over specified periods of time.It gives you transparency of the alerts that are causing you the most trouble, or generating the most noise and will give you a deep insight into a specific application’s overall health. In the words of the OpsMgr APM Product Team, Application Advisor is the tool that allows you to “follow the noise” in your APM environment. 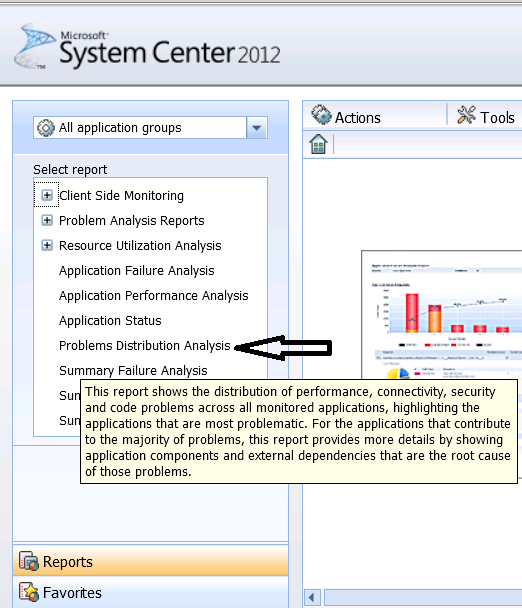 As the primary function of the Application Advisor console is to deliver reports about APM, then it goes without saying that you will need to first have the SCOM Reporting role deployed for it to work. 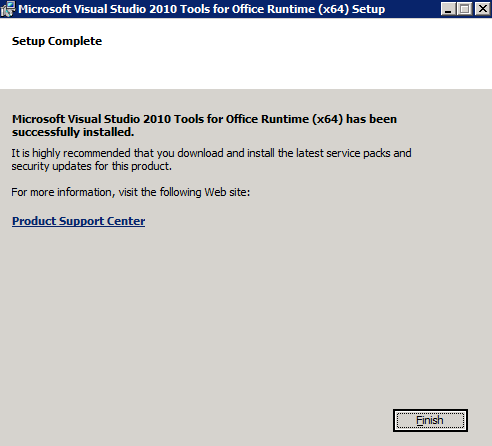 During the Application Advisor install a prerequiste check will kick off to see if you've already installed the SCOM Reporting role and if not, it will warn you that you need to have it installed first. Of course, this also means that you must have SQL Server Reporting Services (SSRS) installed too as it's a prerequisite of the SCOM Reporting role. 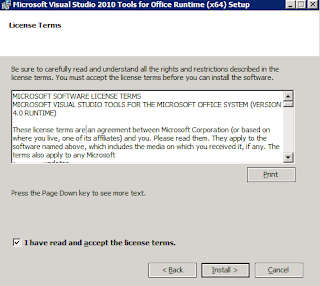 Update Feb 2013: I've made some changes to the required user account permissions below based on an inaccuracy/typo that Microsoft's Tim McFadden (Senior PFE) spotted while reading through this yesterday. Thanks Tim! 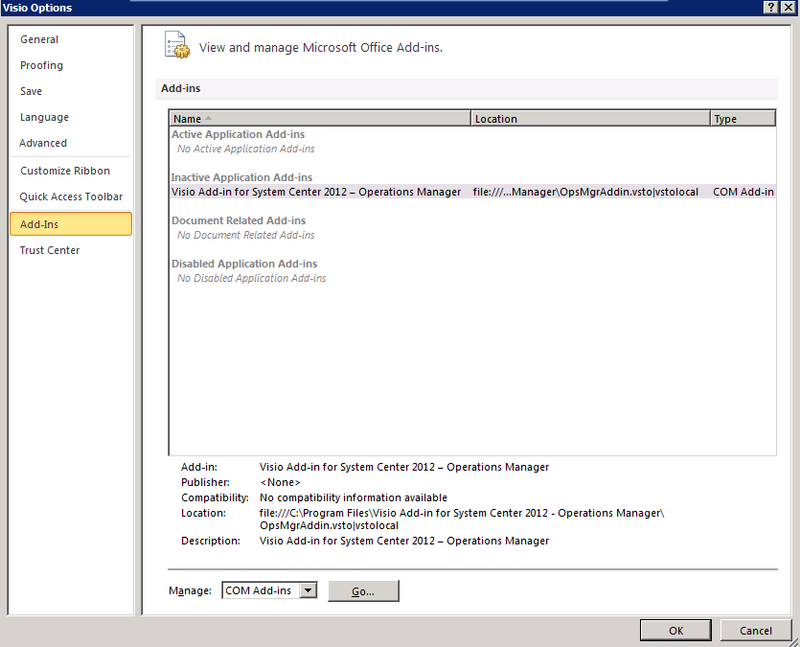 Alternatively, if your user account is a member of the Operations Manager Administrator Role, then you will have access to Application Advisor regardless of membership of the above two groups. 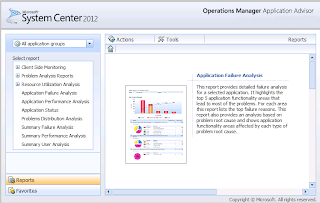 Once you've chosen the application group, from the Select Report section you can choose the type of report that you want by simply expanding the Client Side Monitoring, Problem Utilization Analysis and Resource Utilization Analysis links or by clicking on any of the other seven reports. You can hover your mouse pointer over the name of a report to get a description box explaining exactly what the report gives you back. Once you've made your selections, click the Apply button to save the configuration and generate your report. 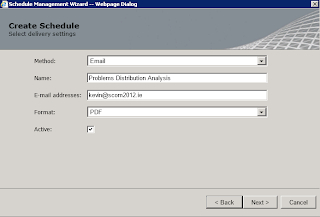 Note: The e-mail option will only work here if it has been previously configured within SSRS. Allows you to save your favorite reports for future use without having to reconfigure them again. 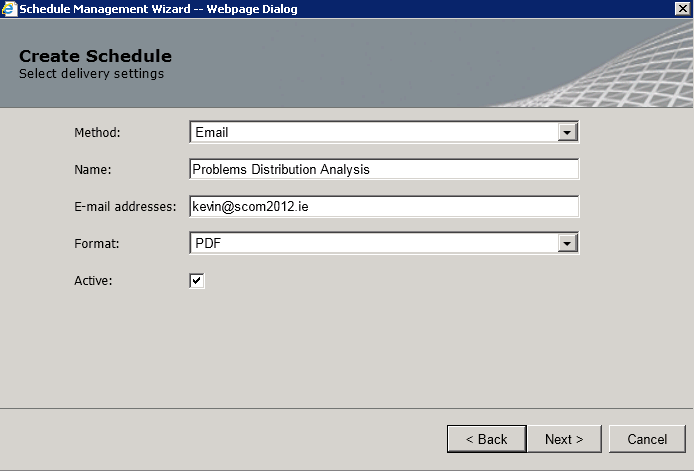 Hopefully you've found APM interesting and learnt something new about this cool addition to SCOM! The new Infrastructure Planning and Design Guide (IPD) for System Center 2012 Operations Manager (SCOM/OpsMgr 2012) is now available for BETA review from the Microsoft Connect Site. I've been waiting for this guide to be made available for a while - notably because I'm co-authoring a book on System Center 2012 Operations Manager and it certainly helps to have the knowledge contained in these guides when working on the architecture and installation chapters! The guide is over 40 pages long and deep dives into a design process which gets broken into different steps depending on your requirements and each of these steps are then further complemented with tasks that require actions to help you through the entire process. As the guide has just been released as a BETA last night, you will need to access it through the Microsoft Connect site and if you haven't registered here, will need to do so first. The benefits of using the Connect site though is that you can make comments and requests on the content of the BETA guide and if enough people make the same requests, then it's possible that the final release of the guide will have your changes included.